In our body, the Mouth (entry to the Oral Cavity), a voluntary sphincter, as the first part of the digestive tract of the stomatognathic system (masticatory system) is adapted to receive food by ingestion, breaking it into small particles by mastication (chewing), and mix it with saliva. In our body, the Cheeks, Lips (Labia oris), and Palate form the boundaries of the Mouth, the oral cavity possesses both hard (teeth) and soft (mucosa) tissues (i.e. tongue) and receives the secretions from the nasal cavities and salivary glands. On and in our body's face, Lips (Labia oris), the visible body part at the mouth (oral cavity), that are soft, movable, tactile fleshy sensory organ of the integumentary organ system. In our body's oral cavity, Mouth Mucosa (Oral Mucosa) is the oral cavity lining, including the mucosa on the gums (gingiva), the palate, the lipscheeks, floor of the mouth, and other structures. The oral mucosa (mouth mucosa) is characterized by a continuous desquamation of its surface epithelial cells, which allows rapid elimination of adhering bacteria. The mucosa that covers the cheek, tongue, gingiva, palate, and floor of the mouth varies according to the anatomical site. The epithelium may be keratinized (palate) or nonkeratinized (gingival crevice). In our body's mouth (oral cavity), the Salivary Glands are exocrine glands, glands with ducts, that produce saliva (salivary juice). The salivary glands secrete the enzyme amylase. 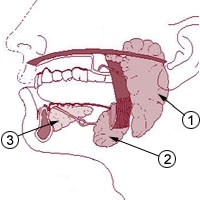 In our body, the Salivary Glands consist of three pairs of major glands: #1 sublingual glands, #2 submandibular glands, #3 parotid gland and hundreds of smaller minor salivary glands that secrete salivary juices into the mouth (oral cavity), which gets mixed with food during mastication (chewing). In and from our body's mouth (oral cavity), the clear oral fluid component, Saliva (salivary juice) is a mucus and serous fluid with a watery and usually frothy substance produced in our mouth. In our body, the serous fluid component of saliva contains the enzyme amylase. Saliva is an important physiological fluid, and together with gingival crevicular fluid constantly bath the oral surfaces, becoming essential for the maintenance of the oral ecosystems, by providing water, nutrients, adherence, and antimicrobial factors. 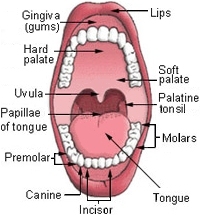 In the mouth (oral cavity) of our body, Saliva is produced in and secreted from the three pairs of major salivary glands (parotid gland), and hundreds of minor salivary glands. Saliva has a cleansing action on the Teeth. Saliva moistens and lubricates food during mastication and swallowing. Saliva dissolves certain molecules so that food can be tasted. Saliva begins the chemical digestion of starches through the action of Amylase, which breaks down polysaccharides into disaccharides.